Centrifugal fans and blowers are powerful, efficient tools for diffusing or cleaning air. With a compact shape and design, centrifugal fans can be used in a variety of areas where space conservation is a necessity. 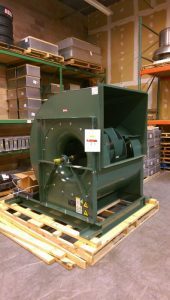 Centrifugal fans and blowers are designed for many different functions and needs, including HVAC systems, filtration, drying, eliminating dust, filtering exhaust and more. Centrifugal fans will eliminate particulates in the air that could contaminate a workplace or damage products. Dynamic Fan supplies a variety of centrifugal fans and blowers with design specifications best suited to each use. Select airfoil, backward inclined, forward curved, backward curved and other designs according to the airflow type, speed, static pressure and air quality that you are working with. Dynamic Fan will send, install and service a wide array of industrial centrifugal fans and blowers. In addition, we can provide you with replacement parts such as motors, bearings, pulleys, belts, and shafts, and can perform routine maintenance on your centrifugal fan to make sure it is running optimally.